Earl C. Paysinger was appointed vice president of civic engagement on July 1, 2016, providing strategic leadership, development, and oversight for USC’s community outreach programs. As a long-serving member of the Los Angeles Police Department, Paysinger joined USC with strong familiarity with the university and the vital role it plays in Los Angeles and in the surrounding communities. For four decades, Mr. Paysinger served with distinction with the LAPD, where he acquired a deep understanding of our city’s neighborhoods, built positive relationships with residents, and advanced a variety of highly effective initiatives. 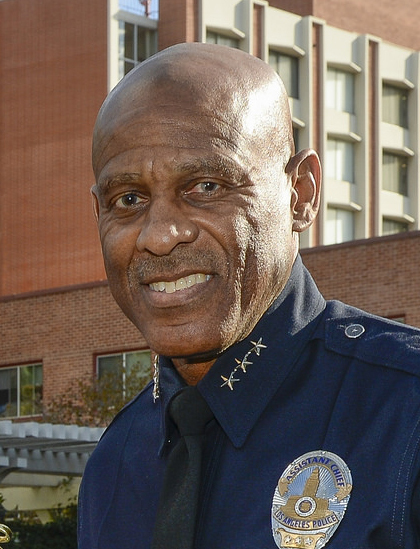 Most recently, he served as first assistant chief of the LAPD, where he was the number two executive and concurrently served as the Director, Office of Special Operations. In addition, he supervised a variety of operational bureaus and divisions that augment the LAPD’s mission in law enforcement. Prior to this assignment, Paysinger served as the Director, Office of Operations under current Chief Charlie Beck and former Chief William J. Bratton. His tenure in this position saw the LAPD attain unprecedented success in crime prevention and reduction, while forging enduring partnerships with communities throughout the greater Los Angeles region. One of Mr. Paysinger’s many hallmark achievements for neighborhoods was his significant enhancement of the 21 LAPD Area Community Relations offices. He revitalized these offices, empowering its leadership teams to more effectively network and engage residents and members of the business community. An important component of Paysinger’s outreach efforts centered around youth development. Notably, he re-engineered the LAPD Cadet Leadership program, which provides more than 8,000 children with vital lessons in academic excellence, character, and judgment. Impressively, participants in this signature program boast a 91% graduation rate from high school, with many going on to attend elite universities and institutions. Earl Paysinger received his bachelor’s degree in criminal justice from California State University, Long Beach. He is also a graduate of the Federal Bureau of Investigation Command College and the highly venerated West Point Leadership Command and Development Program. Additionally, he has been actively involved with a variety of civic and professional organizations, having served as a member on the National Football League Ad Hoc Committee on Youth Delinquency, as well as a special consultant for the Josephson Institute of Ethics Police Advisory Council and as a board member for Goodwill Industries of Southern California.